If you find omelets intimidating — you shouldn’t! 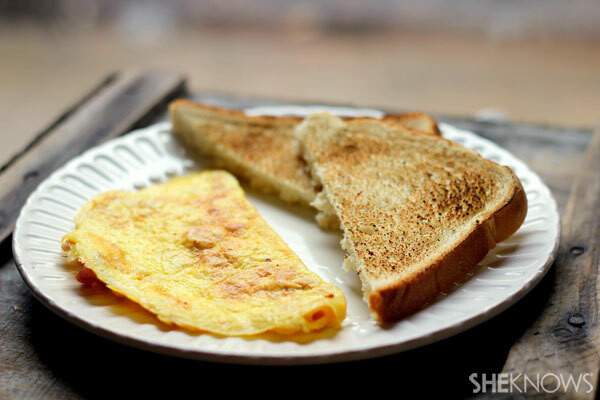 In just a few short steps, you can be making quick and easy omelets. Because the base of the omelet will cook quickly, having all your fillings prepared beforehand is essential. The most common ingredients are ham, white onions, green onions, bell peppers, spinach, sausage, bacon, mushrooms and cheese. You can use any combination of ingredients you want. If you want to get truly creative, consider using other breakfast foods you love — like hash browns or even grits. Try to keep your toppings down to 2 or 3 to keep from overfilling or overwhelming the omelet. Each omelet contains roughly 2 eggs. If you are very hungry, you can add 1 more. Break your eggs into a bowl, one at a time, ensuring no eggshells are in the mix. Add a little water as this will help make the eggs fluffy. Scramble the eggs with a fork or whisk. If you want to add salt, pepper, spices etc., now is the time to do so. Add them to your egg mixture and give it another few rotations. Over medium heat, melt a pat of butter. Once the butter is melted, pour in the egg mixture. Once the eggs have firmed up a bit on the bottom, add in your toppings . Do not add the cheese just yet. Cook until the top appears to be bubbling and is mostly cooked. Gently fold the omelet in half and scoop it onto a plate. Sprinkle it with cheese and set it under the broiler until the cheese is melted.